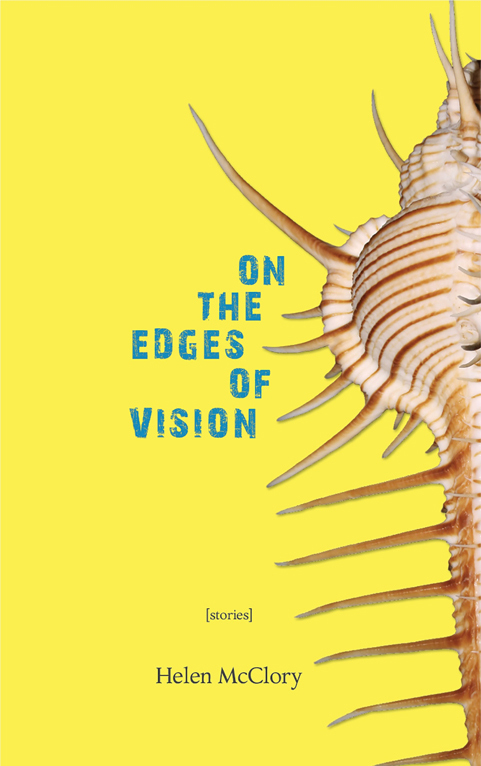 A debut collection that lingers in the curves of your eyes and during the double-blink gazes of late night shadows, Helen McClory has wound tight, unexpected stories in On the Edges of Vision. With forty flash fiction stories taking up a slim amount of pulp, a reader would be tempted to finish at break speed, congratulating themselves on a job well done, but it would be a disservice not to slowly read the prose. McClory has polished each sentence and selected every word to elicit fear, surprise, and, most importantly, the uncanny (that most pleasurable of experiences in literature, if I do blatantly opine). It is hard to pinpoint exactly where the collection as a whole lies: perhaps it is the author’s own fairy tale world, full of lopped-off body parts and viscera. Or maybe bits of the irreal, with familiar characters—vampires, cyclops—but which become unexpected as they slump next to you on a bar stool, buying your next drink. With a paragraph jump soon after, similarities to the Twilight Zone episode “Five Characters in Search of an Exit” are hard to avoid. Instead of peeling away layers, the author seems to add extra strips to her stories, building on what you just read, what you expected, and covering it with a new gooey strip of well-crafted prose. Because the stories are short, the smallest being a paragraph, it would be easy to think of them as ephemeral, bits of fiction to enjoy in one moment before moving on to the next, but as the title of the collection suggests, these stories and characters are hangers on. They might not appear in the forefront of your imagination, but they toil in the side view, translucent memories trailing you as you read on to the next story. In what is no doubt my favorite of the entire collection, McClory makes vivid so many intentions of her craft in “Coral-Red.” The reader feels comfortable in Miriam’s house, which “has been featured in several stylish magazines,” but by the end of the first paragraph, the world is again tilted as it’s revealed the house is currently haunted. Children run through walls as Miriam putters around her house, preparing it for magazine spread photographs. Out of nowhere we learn the truth about Miriam and the violence of her past. Who are these children? It’s here where McClory is most uncanny, and she encompasses that term, which comes from the German Unheimliche, but more importantly the unhomely. What should be familiar and safe is menacing even within a home where one should feel most restful. Many active readers might find themselves manically underlining that sentence. On the Edges of Vision is simmering. It also feels cyclical: even with its last page, the collection continues to go round. Reviewing stories already read, new corners are stumbled upon, missing limbs are found, and characters have changed and frothed. The book is never quite over and like the title suggests, stays on the edges, just out of reach, ready to be revisited. If anything, McClory’s monsters are both homely and unfamiliar, and the tangle is what makes this collection ever so enjoyable. Ariell Cacciola is a writer whose work has appeared in the Brooklyn Rail, Words without Borders, and Publishers Weekly, amongst others, as well as in journals and anthologies in the US and abroad. She holds an MFA in Fiction from Columbia University and is finishing her first novel. She is the World Literature editor at The Mantle, and can be found at ariellcacciola.com and on Twitter at @ariellcacciola.